Shannon and Nick are getting married in the idyllic coastal location, Byron Bay (one of my favourite spots in Australia, and in my own backyard!). 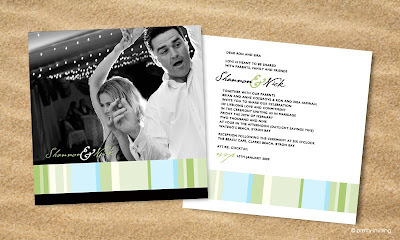 The couple had a great photo of them dancing that they wanted to feature on the front of the invitation and asked that the colour theme reflect their casual and stylish beach wedding. We also created ceremony booklet covers to match.